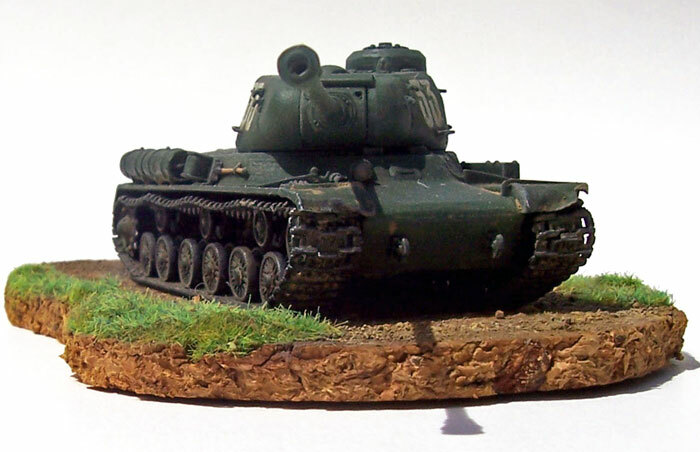 I have always had a fondness for slightly cumbersome looking tanks, so I felt the IS-2 would be a good choice for my second tank after a 36 year break from AFV modelling. I was interested in the fact that the 122mm gun fitted to the IS-2 was quite a leap in up calibre from previous sized guns used by all major participants in WW2. I also wondered why it was superseded in later Soviet MBT’s by a 100 mm gun, so I did a bit of reading on the subject. The IS-2 was intended as a breakthrough tank and there were some advantages to having the AS-19 122 mm gun over the BS-3 100 mm gun, despite the BS-3 having a superior amour penetration capability. The first was that the AS-19 was readily available in larger quantities than the BS-3, and was capable of defeating German Tigers and Panthers at normal battle ranges. Its advantage over the 100mm BS-3 was its lager HE round provided an enhanced and quite devastating capability for dealing with soft targets in the breakthrough role. The downside was the size of the two-part ammunition leading to only 28 rounds being carried and a slow rate of fire of about two rounds per minute. Later improved IS-2s (the model 1944), had a faster-loading version of the gun known as the D25-T, this had a double-baffle muzzle-brake and better fire-control. Ammunition limitations aside, the IS-2 was an impressive and capable design that brought a general parity with the best of German armour on the Eastern front, and for its time was well ahead of what the western allies had. The Italeri kit includes two kits. One is the detailed multi-part version you would expect, and the other is simplified construction offering for war-games use. This second kit still features some nice enough detail but has only 10 parts because the wheels and tracks and moulded as complete units and several other things are simplified. The box advises that the kit is ALZ ZER war-games approved (whatever that means!). As it happens I sold my 10-part kit on an online auction for about a third of the purchase cost of the 2-kit boxing. I understand that this is a true Italeri kit, and not a re-release from Esci moulds. 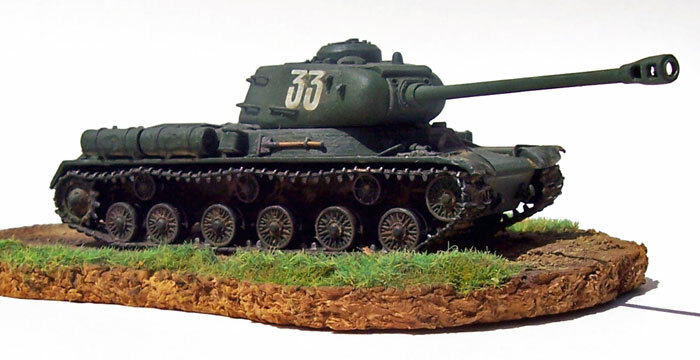 The detailed kit certainly looks like an IS-2 to me, but I’m no expert. Most detail is crisp and the surface suggests cast metal where appropriate. Whether or not the cast finish should be rougher, or the kit should have more crude welds that characterise Soviet armour I can’t say. 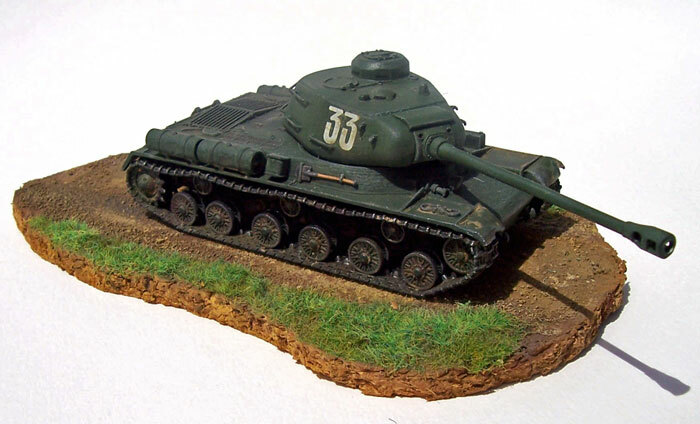 I mention this as I see in some articles that builders of 1/35 Soviet AFV kits often feel the need to enhance or emphasise these aspects in the larger scale; so it might apply to this smaller model as well. External tools and gun crutch are moulded separately, as are the driving light, horn and tow hooks. The turret grab handles are fairly finely moulded, but would still need to have a minute mould line removed on each. Tracks are moulded in styrene consisting of varying lengths and some individual links to cope with going round the drive sprockets and idlers. There seems to be a slight compromise in the detail on the inner sides of the track, but I feel it looks ok. Instructions are clearly laid out and decals for three options are provided. The box is typical Italeri end-opening type with artwork and colour schemes on front and rear respectively. This is the first kit where I have used styrene tracks. I found this system to be quite good, and I bowed the fixed length track sections to represent the characteristic sag between return rollers. In fact the quantity of track as provided seems to be suited to an unrealistic taught set-up, so I used up some spare links intended to be mounted on the hull front to compensate for the gaps created by intentionally sagging the track. I feel it could have done with some more spare links to get a bit more droop. I assembled the wheels and tracks in situ on the hull which made later painting a little tricky. On reflection I could have probably assembled the track with the wheels, sprockets, idlers and return rollers only pushed onto their axles, enabling the entire finished track assembly to be removed form the hull for painting. However I suspect this could be tricky to accomplish. The turret assembly is very straight forward. It seemed far less work to make a plastic card jig and bend some up from fuse-wire grab-handles than clean up the plastic ones. I do feel it would have been nice to have some crew figurers to add some “life” to the finished model, but I guess you can’t have everything. Wire handrails aside; modifications were made to the front and rear track guards which in photos of IS-2’s frequently appear bent, battered and torn. I made mine using lead foil from a wine bottle. I also “bashed” up the external fuel tanks with my Dremel, but I may have over-done this. The horn and head lamp were drilled out, and some clear 5-minute epoxy was added to lamp to represent the glass lens. No recovery hawsers are provided, although these seem often to have been looped across the very rear of the hull. I considered making some from twisted fuse-wire, but as this was intended to be a quick relaxing distraction from building 1/72 aircraft I couldn’t be bothered trying to make the two looped ends to each hawser. 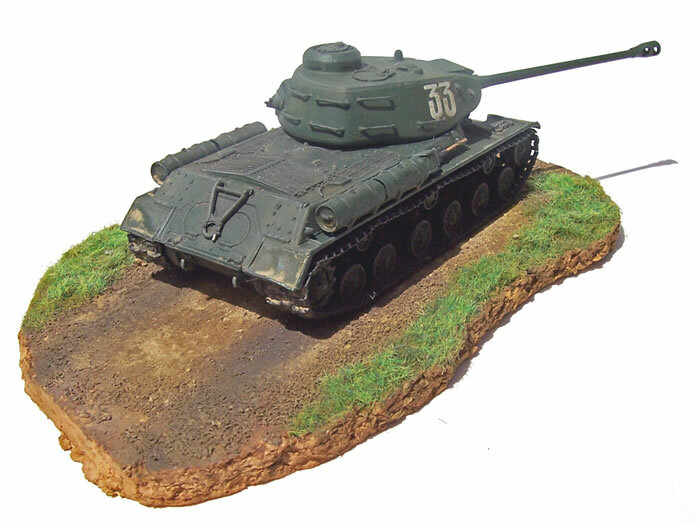 I’m unsure as to the correct green for Soviet AFV’s of the late war period. I’m sure that mine is wrong. It started out lighter and more green than the images suggest, but playing around with oil paints over the Gunze acrylic base gradually changed the model’s tone and hue more than I envisaged. I was not too concerned as this build was for fun and experience. However I would welcome advice on Soviet greens and colours in general (please feel free to email me at mark_davies@orconnet.nz if you can help). The Italeri decals were fine to use, and I added some black-painted decal strip to represent the vision slits and periscope glass. All in all the kit builds in a very straightforward way, and I thoroughly enjoyed it. I’m looking forward to building my Italeri ISU-122 and ISU-152 that have, not surprisingly, much in common with this kit.